Flax contains many healthy benefits including it’s protein, fibre (soluble and insoluble fibres) and omega-3 fatty acid content (usually found in fish sources). Therefore, it is a great idea to incorporate flax into your diet. There are three different forms of flax for consumption: seeds, ground flax, or flaxseed oil. 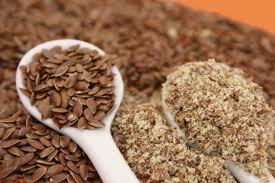 Flax seeds can be added to smoothies, granola, cereals, baked goods etc. Flax meal can be used in baking to add flavour and nutrient content. Flax can also come in the form of flaxseed oil, generally used to make salad dressings. It is not wise to cook with flaxseed oil as the nutrient content is diminished under high heat. So what type of flax would be most beneficial to add into your daily routine? Why is ground flax the best form? Ground flax is made from the grinding of flax seeds which allows for easier absorption of nutrients throughout the body. It provides the body with a great source of fibre therefore, helping to maintain regular bowel-movements and keep a healthy digestive system. Incorporating even a tablespoon of flax into your regular muffins, breads, and cookies recipes will add nutrients and many health benefits. Flaxseed oil is great to use in making salad dressings as the omega-3 fatty acid content greatly increases in the oil form (2.59g ALA per 1 tsp!). To refresh your memory on the importance of ALA in the diet check out my Food Fact of the Day on Chia Seeds.